I sometimes think I live in a parallel universe. 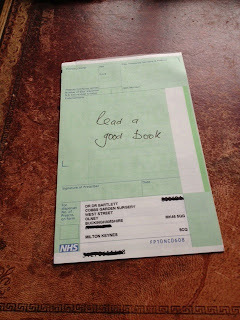 So I read today of a 'new' scheme for books on prescription to be launched in May. The Society of Chief Librarians and the Reading Agency have announced the scheme with support from, among others, the Royal College of General Practitioners. The idea is for GPs to write 'prescriptions' with recommendations for a suitable title, particularly for patients suffering from mental health issues, to be obtained from local libraries. But many GPs have been doing this for years. I thought I would give my top three books which I have recommended countless times over the last few years. 1. Overcoming Anxiety by Helen Kennerley. This is an excellent read clarifying the basic principles of cognitive behavioural therapy. It has useful chapters on relaxation and breathing exercises in addition to a simple explanation of the link between negative and anxious thoughts and their physical accompaniment. Not a big book so doable by most patients. 2. Say Goodnight to Insomnia by Gregg Jacobs. This is far and away the best self-help book I have read on the pervasive problem of insomnia. It's been great to see patients significantly helped by applying the principles here. It too uses a cognitive behavioural approach, but with some creative and counterintuitive ideas such as sleep restriction, which has proved so helpful for my patients. 3. Feeling Good by David Burns. Slightly dated and rather wordy, but the first half of the book is wonderfully helpful to those patients battling with depression. The chapters on 'disorders of thinking' such as catastrophising and negative self thoughts are at the core of the book and when understood and grappled with by the patient can be very therapeutic.